One of the great privileges of being a priest is to conduct what we call `the pastoral offices’ or `rites of passage’ – baptisms, marriages and funerals. It’s a privilege because we are invited to stand beside people at some of the highest and lowest and most important moments of their lives. We are fortunate that in our six churches we have about sixty-five weddings a year! This is many more than most groups of country churches, for in addition to local couples there are many for whom these churches, beaches, villages and coastal walks have become very special. The churches are extraordinarily beautiful and while St Enodoc is in the middle of the golf course and St Michael’s overlooks the estuary, our other churches all offer something special – and a sense of holy ground. Through the exchange of vows, the couple declare before God a public and life-long covenant between each other. The Church witnesses to these vows and to God’s blessing of their covenant, offering prayers for the couple’s life together. The Church of England has for long recognized that marriages can fail. The Church’s attitude to `remarriage’ has become more positive in recent years and it is possible for a divorced person to be married in church. I do ask to see all couples asking for `remarriage’ before definite arrangements are made. I always feel shy about this and assure you that it is not an intrusive or judgemental conversation. I simply seek to be reassured that a) the Church would not be acting irresponsibly in conducting your marriage; b) children are cared for; c) you are content that your marriage is not jeopardised by any sense of guilt or failure from the past. This could be quite a short conversation, but it can also be a time when I get to meet the loveliest of couples and we end up talking about the whole of Life! We are also very glad to plan some kind of Service of Blessing with you. A couple may have been married on the beach in Weymouth or in a telephone kiosk in Macedonia, but would be glad of a joyful service in church here when we celebrate with you and pray for God’s blessing upon you. These services vary from intimate and sacred moments with just the three of us, to something which is very like a full-blown wedding. We can talk. Some of the highpoints in our life are the anniversary blessings. We welcome enquiries if you are thinking about any of these things, whether you live within our parish boundaries or elsewhere, and are always happy to talk things over with you. 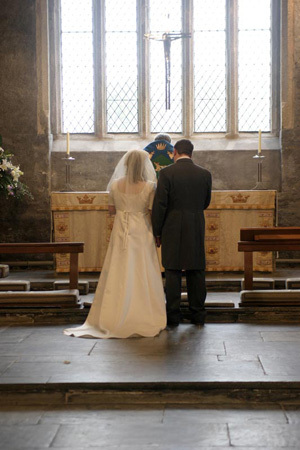 For wedding bookings, please contact initially Revd Elizabeth Wild by email to her or phone her on 07758 407 661.